I'm sure it's hard to remember this when you can't see your feet, but you look wonderful! My best friend is only 7 months and has already gained 55 lbs (her Dr is ready to strangle her). 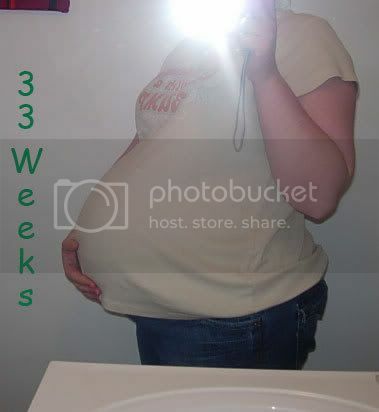 Wow...I cannot believe how big your belly is...You still look so good though! It's all baby, baby! Got an update from Mandy yesterday... keep those girls cookin' for a little while longer! You look beautiful. It won't be long now!!! Yippee! Your shirts still cover your belly? SO not fair. I have some XL shirts that won't cover the belly. Still seeing the twin belly does make me appreciate only cooking one giant boy in there!